I am a multi-genre writer. I started out writing screenplays and then transitioned to novels and plays. Since my background is in dramatic works, I focus a lot on plot and dialogue in my Dodie O’Dell Mystery Series . I have had play readings at a number of theatres in the New York/New Jersey area and a number of years ago, I co-wrote a play about Hurricane Katrina survivors in New Orleans. I also wrote and directed a short film. But I am a mystery book lover at heart. I once stayed home from work to finish a novel! I remember being read to at a very early age but Nancy Drew mysteries and the Bobbsey Twins series stand out. I am reading several books now: AMERICANAH , Louise Penny’s series (specifically A FATAL GRACE ) and ASTROPHYSICS FOR PEOPLE IN A HURRY! I can’t remember a time when I didn’t want to write! In grade school and high school, I tinkered with plays and short stories. But then I got caught up with theatre and my focus shifted away from writing. But fortunately I found my way back about twenty years ago and now I am focused on my mystery series. I generally do most of my writing in a home office in northern New Jersey. But I do take notes everywhere… Snippets of conversation, character ideas, everywhere I go it seems I find material! Now that I have a series going, there is a town and its inhabitants that lay the groundwork for each novel. But each novel also introduces new characters, so many ideas come from them! The characters speak to me…Ideas also are generated by the play that I have chosen for each novel. 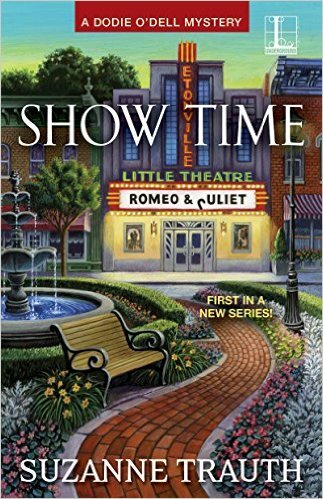 For example, the first Dodie O’Dell mystery featured ROMEO AND JULIET so the play was a springboard for the setting, character interaction, and murder mystery. In the mystery world, I am truly inspired by Elizabeth George and Louise Penny. Each of their series provides food for thought, exceptionally well-plotted stories with strong and engaging characters. In the non-mystery world, I love to read a range of authors. ALL THE LIGHT WE CANNOT SEE stands out. I love books set during World War II. For me getting the first draft down can be a challenge. Thoughts and ideas tumble out while I am trying to adhere to a very loose outline. Once the draft is finished and I start the next draft, it can be a challenge to establish clues, investigative procedures, and red herrings! I want to keep the reader engaged but not give away the end of the book. I think all of the standard elements must be present for a good story: well-drawn characters, a strong setting, believable and interesting dialogue. And then the X factor…that extra something that really pulls in the reader and makes her want to stay up all night, or skip work, to finish. Hmmm…great question. I suppose I see myself in several characters. Dodie’s management skills, adventurous spirit, and sense of humor; Walter’s wacky rehearsal exercises; Lola’s friendship. Write what you know? Or at least write what you enjoy…I have loved mystery novels since I was a grade schooler, beginning with Nancy Drew. Reading a mystery novel is like solving a puzzle and puzzles fascinate me. What makes your books different form others out there in this genre? 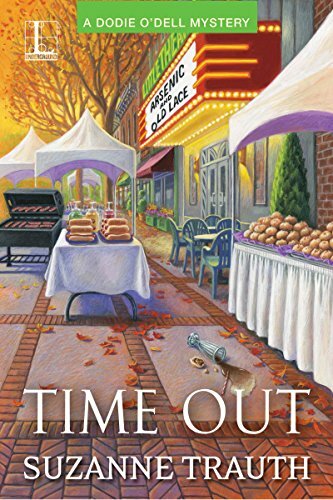 There are so many wonderful mystery series out there…when I started in on the Dodie O’Dell books, I decided to place the mysteries within the context of a small town restaurant (the Winderjammer) and community theatre (the Etonville Little Theatre). So, I am combining food and theatre. I think that combination might be unique. Thank you, Suzanne, for being my guest today! Suzanne Trauth is a novelist, playwright, screenwriter, and a former university theatre professor. She is a member of Mystery Writers of America, Sisters in Crime, and the Dramatists Guild. When she is not writing, Suzanne coaches actors and serves as a celebrant performing wedding ceremonies. She lives in Woodland Park, New Jersey. Readers can visit her website at www.suzannetrauth.com and on Facebook. TOUR PARTICIPANTS Please visit all the stops. I like the snowy background on the cover. Thanks! New Jersey is one big snowball in the winter!! 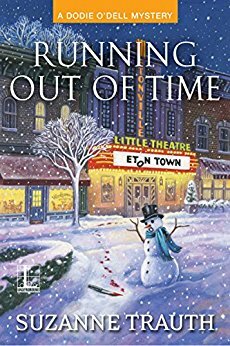 We had a rare light dusting of snow this morning, so the cover of Running Out of Time appealed to me. I love a light mystery, and this one sounds intriguing. Thanks for the great interview! I love hearing different author perspectives on these questions. It’s fun to do interviews…it makes me think about my writing…why I do it, where the ideas come from. What got me writing in the first place! I really enjoyed the excerpt from the book and would love to read. Great cover! Thanks so much! I appreciate the support! Kensington Publishing does a terrific job with cover designs. That’s nice! Enjoy! And let me know what you think on FB!